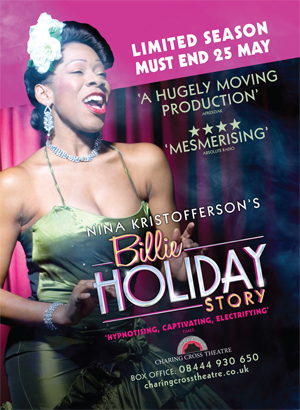 Described by The Times as ‘hypnotizing, captivating, electrifying’, actress, singer and writer Nina Kristofferson brings her one woman show ‘The Billie Holiday Story’ to the Charing Cross Theatre. This London engagement follows a sell-out run at the Edinburgh Festival in 2011, and a tour of the UK in 2012, which attracted critical and public acclaim. Info: The Billie Holiday Story will be at the Charing Cross Theatre, The Arches, Villers Street, London WC2N 6NL from April 1, 2013, 7.30pm for 8 weeks only.